The statue represents a squatting man on a socle, with his cloak wrapped tightly around him. The hands protrude from the garment and rest on his knees, the right holding the lettuce associated with Min. The left hand is flat. A short ceremonial beard is attached to his chin. He wears a smooth wig, that covers the upper part of his ears. On the front of the statue, on the lower legs of the man, is a scene carved in low relief: Osoroeris adores the triad of Karnak. Underneath are a few lines of text. 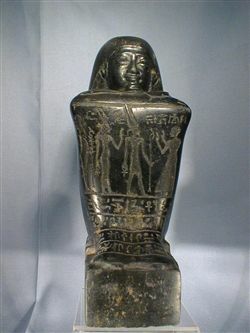 The socle is higher under his bottom than under his feet. The statue has a back pillar, on which a text is engraved. Above, Osoroeris kneels, adoring Amun. There are two small inscriptions on the shoulders. The facial features are rather coarse and lack individuality. The two scenes are executed in shallow relief without details, reducing the figures to silhouettes. (4) those who have gone by, the noble ones, when you make the statues endure in truth. (6) Re, (my) heart is on my throat, your light revives my limbs. (10) chief of the secrets of the god, Iry-iry justified, borne by the lady of the house, the musician of Amun-Re, Nestefnut justified. (If) evil be spoken, everything shall pass me. (12) son of the god's father Iry-iry justified.